Middle Tennessee’s run in the inaugural Emerald Coast Classic came to an end Saturday night in a 57-47 loss against No. 23 Creighton (6-1). It was a tale of two halves for the Blue Raiders. MTSU was down by as much as 21 points in the first half. However, they would battle back in the second half to pull within ten points on 39.1 percent shooting and by out-rebounding the Bluejays 29-24. The Blue Raiders (3-3) started the game off with yet another different starting group. The group included: DJ Jones, Marcus Tarrance, Joshua Phillips, Jacquez Rozier and Reggie Upshaw. This marked the fourth different starting group for MTSU in their first six games. The starting line-up brought more intensity, getting the Blue Raiders off to a quick start and 4-3 lead in the first five minutes of the game. The Bluejays would counter though with a 7-0 run to go up 10-4. Creighton was able to take advantage of the Blue Raiders’ first-half mistakes. The Bluejays scored seven points off turnovers and out-scored Middle Tennessee 12-4 in the paint. MTSU came out hot shooting the ball, but the shots did not fall consistently throughout the first half. They would finish 26.1 percent (6-of-23) from the field, while Creighton shot a healthy 60.9 percent. The Bluejays had four players sink a three-point basket in the first half as they went 4-of-7, with their bench pitching in 16 of their first-half points. The second half was a different story for the Blue Raiders. MTSU came out of the locker room and went on an 8-0 run to gain momentum and cut the deficit to 13 points with the help of a three-pointer and a floating jumper from Jaqawn Raymond. The defense proved to stifle the Bluejays in the second half, holding Creighton scoreless from the field for 15 minutes and 21 seconds. The Blue Raiders were able to get back in the game by forcing the Bluejays to go 3-of-14 from the field in the second half. The Blue Raiders kept battling and were able to pull within ten points with 7:31 remaining in the game off of a dunk by Raymond that was set up by Giddy Potts off the fast break. The Bluejays’ Isaiah Zierdan hit a clutch three-pointer before the final media timeout as he was fouled on the play by Marcus Tarrance. The four-point play extended Creighton’s lead to 13 points to give the Bluejays a 50-37 advantage. MTSU never gave up though, narrowing the lead to single digits. The Blue Raiders would score 12 points off of turnovers in the second half and increase their points in the paint output by 16 points from the first half. The MTSU bench had another great night, scoring 20 points with Raymond leading the way with nine points. 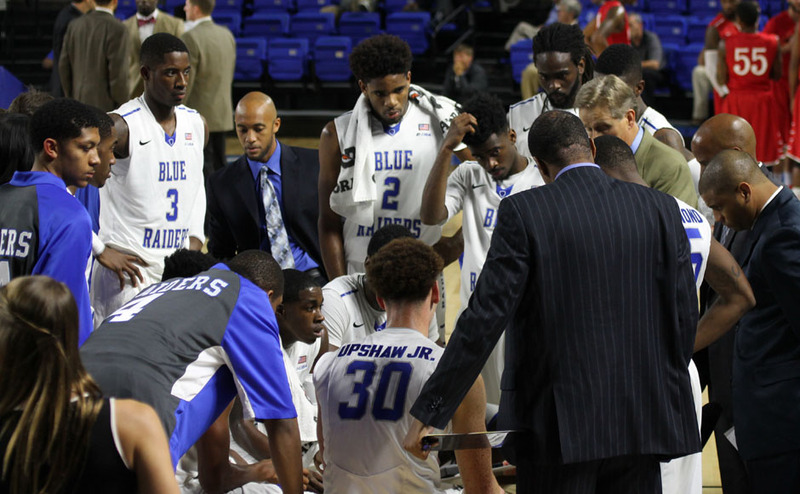 The Blue Raider bench has recorded 40 percent of the team’s points this season, mainly due to the team’s constantly changing starting lineup. MTSU will return to the court in a rivalry matchup at Belmont on Tuesday, Dec. 2 for a 7 p.m. CT tip off.